WHEN THE CIRCUS COMES BECKONING………. In 1929 my dad was just a young lad of 9, staying in the little tin mining town of Batu Gajah. According to him, cinemas and televisions were unheard of then. Chinese operas (called tuk tuk chiang in Cantonese) were popular instead, especially during festivals, mostly held near the Kuan Ti Temple ground, near the Kinta River that flows along some small towns in Perak.But opera is heavy stuff, too boring for a kid of 9. He preferred circus. Watching the trapeze swinging from bar to bar, the clowns with their funny antics and animals like elephants or tigers performing stunts kept him mesmerized. These circuses travel from town to town, performing to large crowds of young and old in huge tents. So when he heard that a circus is coming to town, he was very excited and determined not to be left out. Having gathered a few equally enthusiastic boys, they cycled from their village to town to watch the circus. The problem is, none have enough money in their pockets to buy a ticket each. But this does not deter them from having a jolly good time, because boys will always be boys! Upon reaching the circus ground, dad began to hatch a devilish plan and whispered it into their ears. All understood and nodded approvingly. Halfway into the performance, these mischievous boys sprang into action. One of them gathered some pebbles from the ground in his fist and creeping quietly from behind, threw them at the old fat guard sitting near the entrance of the tent. He was rudely awoken from his little nap. Infuriated, the poor fellow gave chase and while the entrance was left unmanned, the rest of the boys would make a quick dash into the tent and assimilate into the crowd. The boy who threw pebbles would run off and disappear into the bushes, leaving the poor guard panting and swearing. The same tactic is used the next night and the next. All the boys took turns to throw pebbles at the poor fellow while the rest ran inside and watched the circus without having to pay! Some 70 years later as dad puts his little grandchildren on his lap and watches the circus together on TV, he would recall his juvenile folly and burst into a toothless laughter, tears streaming down his wrinkled cheeks. Note: Sorry, I do not have a photo for this post. As a little boy from a poor family, dad could not afford to buy a ticket, let alone own a camera to capture what he saw at the circus. At the doorstep of hell….well,almost. Hi guys,nice knowing there are some people out there who loves circus just like dad and myself.It was an unforgettable experience -the thrill,the excitement and the amazement of seeing live animals,clowns and acrobats performing amidst thunderous applause.It was a wholesome entertainment.Like riversidegrass pointed out,it is really a pity we can’t find circus anymore. This article linking me back to some 18 yrs ago memories. There was a London Royal Circus (if not mistaken ), world tour stopping at Bangsar, KL. Haaaaaaaaaaaaaaaaaaaa…………..this news appeared in the Star paper. Does anyone still remember this? Hi KLboy…..yes, i remember reading about that lion! poor thing, apparently many of the animals (from Royal London Circus) were underfed. but after such news made the headlines, i suppose the circus organisers had to do something about it. yes, circuses were FUN! I remember my first experience: my brother, my cousins and I were laughing at the clowns – then one of the clowns came to the audience to get a valunteer. we freaked out and started hiding behind the our parents! hahahaha…..
Back in the 50’s to 60’s, if I remember correctly the local circus was named ‘Tai Thean Kou’. It also had a large steel orb where a motorcyclist would ride all over it. Thanks ipohgal for this article! This story brings back many happy memories for me too when I was a young girl in Ipoh back in the 50s.My family would bring us to the circus whenever there is one in town.I can still recall one near the Odeon Cinema area,held on a big piece of ground new the hawker stalls,mostly at night.It was a big big carnival. Too bad we can’t get to see anymore circus nowadays.Where have all the clowns,animals and acrobats gone? Sigh!! !Now I can only tell my grandchildren about it. ah yes, that large steel orb! sometimes there would be 2 or more riding in the orb…. Hi Felicia,I really felt nostalgic whenever I think about circus.If only we can still have this sort of entertainment to brighten up our mundane lives,instead of the usual stuff most of our youth indulges in now-those computer games and whatnot. Walk up to a child and try asking him or her what a circus is,chances are they will stare blankly at you or give you a shrug of the shoulder.I think somewhere along the road,we have lost our innocent childhood…..
yes, Ipohgal! circuses may seem ‘boring’ to the children of today, compared to computer games. but have you seen some of those computer games? so violent and gory…..I fear the impact it has on the young ones. Hi Felicia,back in those days,when we went for circuses or even magic shows,we have good laughs and would exchange happy observations among ourselves long after the show is over. Now? Not only violent and gory but those games makes computer geeks highly addictive and exasperatingly incommunicative.Progress,perhaps? Hey, can I know what are the popular circus in Malaysia back in the days? lol! addictive, yes……incummunicative, yes too! magic shows are now shown on tv – but nothing like seeing it live! two Big Tops whenever circus comes to mind. Ah, I almost forgotten about this humourous part. Even my elderly grandpa came all the way from Batu Gajah to Ipoh just to see Rose Chan’s striptease shows and he must have liked her tremendously. Why did I said so? He insisted my eldest sister to be named “Ah Chan” when she was born during the height of Rose’s popularity but my parents shot down his suggestion and of course he sulked for sometime. The reason for my parent’s refusal? They don’t want people to tease my sister’s name. Hi Ipohgal! this is one story (abt Rose Chan and her shows) which we MUST feature in the Ipoh book…..hahhahaha……. i wonder what it would have been like if your sister was named after Rose…. Hi Felicia, I bet my sister would like it too but I am not sure. Let me ask her when I see her. As for girls name during the 50s and 60s, Ah Chan is already a very popular name before Rose Chan got famous. It means true or sincere. Usually we say “Chan sum” meaning true heart, very romantic indeed. Along with Ah Chan, other popular girl’s name of that era were Ah Ling, Ah Lan, Ah Far and Ah Chu and many others but my parents did not give us such names. They said these are too common. Strangely enough, those children grown well after named such nickname. Do you know there is a song call “Rose Rose I love you”? Very famous song of old. Anyone has the lyrics? Nice song you know. I remember vaguely the tune but forgotten the words lah. Katherine,here is the Mandarin version of “Rose,Rose I love you”. Katherine, thanks for ringing the bell! Yes, “Rose,Rose I love you” is indeed a catchy song with a nice melody and playful lyrics. 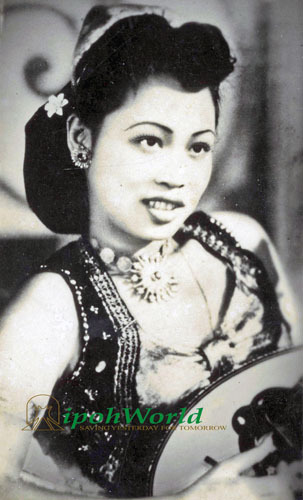 A search revealed that the original song was the Mandarin version sung by Yao Lee in 1940. The lyrics by Wu Cun and music by Lin Mei. It became an instant chart hit. The English version was sung by Frankie Laine in 1951 with lyrics by Wilfred Thomas and like it’s Chinese version, also became a chart hit. I can imagined a sailor singing this farewell song to the Flower of Malaya, Rose Chan aka Chan Lai Chun! Hi ipohgal, that’s a great link. Well spotted and thank you for sharing it. We do have blog pages om most of the famous schools and these may be a good place to take up Katherine’s suggestion. We only have one blog that mentions MGS. It is at http://www.ipohworld.org/blog/?p=1407. That might be a good place to fill us all in on your schooldays. Hi Ika, is that the closest you have of MGS? Do you have a picture of the school complex and the sprawling field facing the Tow Boo Keong Hall? Care to share with me if you do have one? I do have plenty of memories of primary and secondary MGS but no photos to show the school building, preferably facing Jalan Kampar. The secondary school building is a beautiful heritage building but it has been a long long time since I last saw it. Though my days there are not exactly happy ones but I do loved the building and the field. Ipohgal, please go to http://www.ipohworld.org/search8/ then select photograph and type the keyword mgs. That will give you a selection of all mgs we have. Click on the blue words in turn and let me know which one you would like by the code number bottom left. I can then send it in higher resolution. Are you going to do a full Saturday Blog on the school? Hi Ika, yes, I will do a full Saturday blog on the school where I spent 11 formative years. There will be bitter sweet memories but I will only do it in October after I have finish with Hume Street and my family. This will take another 3 months. Why not I let you know later when I am ready? Hi Katherine. i must say, those memories of the nuns at Convent are great treasures. i was told similar stories by my mum and aunts – especially about those STRICT nuns! but during my time, the school was run by locals…..the nuns had either passed on, or retired in the Cheras Convent. the strict rules however were still there – was never fond of them, but they were for our own good! I have “tasted” all these and be able to forget them even after so many years! I have “tasted” all these and WERE UNABLE to forget them even after so many years! By the way thanks for sharing your lifelong stories. Hi oldtimer, thanks for your memories of Rose Chan. 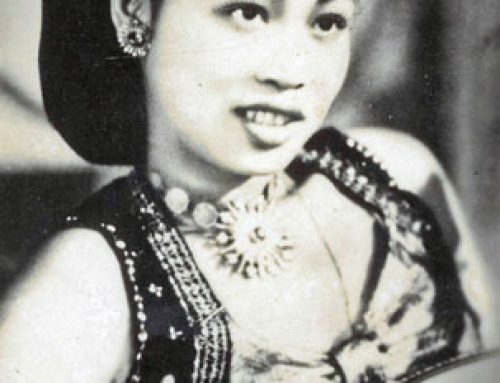 What people remembered her most is that she is a pioneer of striptease in then Malaya. And her very sad childhood as well as her generosity in giving to charities make her stand head and shoulder above the rest. This is what we like to remember her for. She is unforgettable just as she is irreplaceable. Hi Oldtimer, I have just downloaded the theme song ‘cherry Pink & Apple Blossom White’. What a lively cha cha song and I am already in a mood for a cha cha! thanks alot!